It has been a tense time, watching Hurricane Irma with helplessness take her wrath on our lovely Virgin Islands. It is heartening to see the assistance being given to the islands, and the recovery process beginning! We know the people are strong, resilient & proud, and we look forward to doing our part with them. Reports have been coming in…. Below is a list of yachts and their status, following the hurricane. Some yachts were, of course, heavily damaged, but most have survived. We have noted a degree of hesitation to charter in the Virgin Islands now. Certainly, we must all be conscientious in our activities. Top notch sailing is still there. Beaches are still there. The bars will be there, just a little less fancy for the moment! There will still be everything available for beautiful fun-filled charters… lovely catamarans, great service, good food & beverages, Anegada lobster, and warm clear waters with tropical breezes. Given the option to cruise down island, the Grenadines, for instance, a beautiful cruising ground to the South not effected by Hurricane Irma, many charter crews in the Virgin Islands have taken the stand to decline charters there, even at this early juncture, such is their belief in the Virgin Islanders spirit to clean up by Christmas, the start of the season, and continue chartering in the Virgin Islands this winter, to show visitors the wonders of the Virgin Islands and her beautiful waters. So keep the faith. 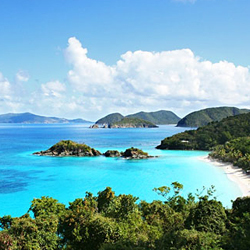 Come sail the Virgin Islands this winter!